Is your child was born during Moola Nakshatra? If child born in Ashwani, Revati, Ashlesha, Jayestha nakshatra then child known as gandmul nakshatra. There are several nakshatra and there is myth of gandmul nakshatra. However, there is no need to worry. Many people are lucky who born in gandmul nakshatra. 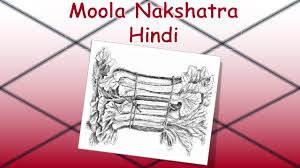 The mula nakshatra is worshiped on the 28th day after child birth. If one cannot worship of mula nakshatra on the 28th day then chant “Om Rudraya Namah” on Saturday. Also, offer supari to lord Shiva regularly. If a person has birth on Monday, Wednesday, Thursday, Friday or Sunday then the effect of mula nakshatra reduces. One cannot get good fruits on time of their hard work if their birth is in gandmul nakshatra. People will depend on others. Every mula nakshatra do not give bad effect. The effect of mula nakshatra decrease if one has birth in Leo, Scorpio and Aquarius zodiac. If one has birth before the first phase of Ashwani nakshatra, fourth phase of Revati nakshatra, fourth phase of Ashlesha nakshatra, first phase of Magha nakshatra and fourth phase of Jayestha nakshatra then there is an impact of mula nakshatra. If the moon is in sky during the birth of boy then the effect of mula nakshatra reduces. If the boy’s birth is not on new moon day then the effect of mula nakshatra reduces. If the girl’s Jupiter or Mars is good then the effect of mula nakshatra reduces. Donate flour on full moon day. Donate gangajal in small bottle. Donate jaggery or jaggery products. Donate wheat. Take water from 28 rivers, pond and well. Put it in glass bottle and keep it at worship place. Health Problem Creating Hurdles in Kids Education? How To Get Rid Of Body Toxic That Leads To Laziness? ?